Texas: One Nation Under Arrest – With Liberty and Justice for Some! One will quickly learn that Texas is a Corporation (The State of Texas) that has a vast amount of resources to spend on the court cases against the non-state entity, and the new owners will spend it all to prove their ownership of the citizen. An ironic ideal that one must pay taxes to an entity that can and will use that income against the person who paid it initially in the form of taxes, and prosecute, and arrest someone for NOT paying said taxes. If one thinks that they own their property, a car, land, or business, then do NOT pay taxes to the county or state, as they require, and see how long it takes for the real owners to show up and educate the “owner” on their lack of payment for the use of said property. How many rules, regulations, statutes, laws or codes does Texas have that the citizenry are responsible in following and knowing, and how many Federal laws are there that supersede state laws? There has not been a definite number acquired in answering this question. The official answer is that “they” DO NOT KNOW! If you think the answer to this question can be found in the volumes of the Statutes at Large, you are partially correct. The Statutes at Large is a compendium that includes all the federal laws passed by the U.S. Congress. However, a total count of laws passed does not account for the fact that some laws are completely new; some are passed to amend existing laws; and others completely repeal old laws. Moreover, this set does not include any case law or regulatory provisions that have the force of law. In a conversation about this topic, a friend asked me, “What about the United States Code?” The current Code has 51 titles in multiple volumes. 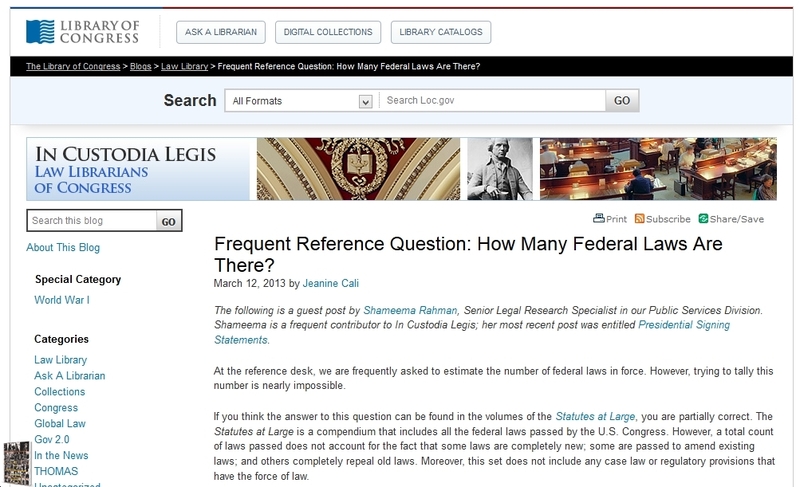 It would be very time consuming to go page by page to count each federal law, and it also does not include case law or regulatory provisions. While we are on the topic, would you like to know the difference between the United States Code and the Statutes at Large? According to the Government Printing Office, “the Statutes at Large, is the permanent collection of all laws and resolutions enacted during each session of Congress.” The laws are arranged by public law number and are published in the Statutes at Large. The set also includes concurrent resolutions, proclamations, proposed and ratified amendments to the Constitution, and reorganization plans. Until 1948, treaties and international agreements approved by the Senate were also published in the Statutes at Large. This set is organized by year. So, if you are interested in locating the laws of passed in 1996 you need to consult the volumes for that year. Imagine having so much freedom, that you can not even count how free your are NOT! If our own lawmakers do NOT know how many current laws there are on a Federal level, then it would be no surprise that the answer is the same for the state, county, and municipal levels. Ask any judge this question: “How many laws are there, local on up to federal?” When they fail to give an exact number, ask them then, “how as an officer of this court, do you intend to practice a craft in which there is an infinite amount of ways in which to make one a criminal, yet the court is not able to cite a source as to the number of said laws.” Where is the Justice in this system, the only thing it seems to be is a system in which to convict, infinitely. Texas residents are in a literal conviction system which leads to the fact that Texas: One Nation Under Arrest is not just applicable for Motorcycle Clubs, it applies to us all. "State property" redirects here. For other uses, see State property (disambiguation). For the socialist concept, see Social ownership. Not to be confused with Public good. State ownership (also called public ownership and government ownership) is the ownership of an industry, asset, or enterprise by the state or a public body representing a community as opposed to an individual or private party. Public ownership specifically refers to industries selling goods and services to consumers and differs from public goods and government services financed out of a government’s general budget. Public ownership can take place at the national, regional, local, or municipal levels of government; or can refer to non-governmental public ownership vested in autonomous public enterprises. Public ownership is one of the three major forms of property ownership, differentiated from private, collective/cooperative, and common ownership. In market-based economies, state-owned assets are often managed and operated as joint-stock corporations with a government owning all or a controlling stake of the company's shares. This form is often referred to as a state-owned enterprise. A state-owned enterprise might variously operate as a not-for-profit corporation, as it may not be required to generate a profit; as a commercial enterprise in competitive sectors; or as a natural monopoly. Governments may also use the profitable entities they own to support the general budget. The creation of a state-owned enterprise from other forms of public property is called corporatization. In Soviet-type economies, state property was the dominant form of industry as property. The state held a monopoly on land and natural resources, and enterprises operated under the legal framework of a nominally planned economy, and thus according to different criteria than enterprises in market and mixed economies. Nationalization process of transferring private or municipal assets to a central government or state entity. Municipalization is the process of transferring private or state assets to a municipal government. A state-owned enterprise is a commercial enterprise owned by a government entity in a capitalist market or mixed economy. Reasons for state ownership of commercial enterprises are that the enterprise in question is a natural monopoly or because the government is promoting economic development and industrialization. State-owned enterprises may or may not be expected to operate in a broadly commercial manner and may or may not have monopolies in their areas of activity. The transformation of public entities and government agencies into government-owned corporations is sometimes a precursor to privatization. State capitalist economies are capitalist market economies that have high degrees of government-owned businesses. Public ownership of the means of production is a subset of social ownership, which is the defining characteristic of a socialist economy. However, state ownership and nationalization by themselves are not socialist, as they can exist under a wide variety of different political and economic systems for a variety of different reasons. State ownership by itself does not imply social ownership where income rights belong to society as a whole. As such, state ownership is only one possible expression of public ownership, which itself is one variation of the broader concept of social ownership. In the context of socialism, public ownership implies that the surplus product generated by publicly owned assets accrues to all of society in the form of a social dividend, as opposed to a distinct class of private capital owners. There is a wide variety of organizational forms for state-run industry, ranging from specialized technocratic management to direct workers' self-management. In traditional conceptions of non-market socialism, public ownership is a tool to consolidate the means of production as a precursor to the establishment of economic planning for the allocation of resources between organizations, as required by government or by the state. State ownership is advocated as a form of social ownership for practical concerns, with the state being seen as the obvious candidate for owning and operating the means of production. Proponents assume that the state, as the representative of the public interest, would manage resources and production for the benefit of the public. As a form of social ownership, state ownership may be contrasted with cooperatives and common ownership. Socialist theories and political ideologies that favor state ownership of the means of production may be labelled state socialism. State ownership was recognized by Friedrich Engels in Socialism: Utopian and Scientific as, by itself, not doing away with capitalism, including the process of capital accumulation and structure of wage labor. Engels argued that state ownership of commercial industry would represent the final stage of capitalism, consisting of ownership and management of large-scale production and manufacture by the state. Within the UK, public ownership is mostly associated with the Labour Party (a centre-left/democratic socialist party) specifically, due to the creation of Clause IV of the Labour Party Manifesto in 1918. Clause IV was written by Fabian Society member, Sidney Webb. When ownership of a resource is vested in the state, or any branch of the state such as a local authority, individual use "rights" are based on the state's management policies, though these rights are not property rights as they are not transmissible. For example, if a family is allocated an apartment that is state owned, it will have been granted a tenancy of the apartment, which may be lifelong or inheritable, but the management and control rights are held by various government departments. There is a distinction to be made between state ownership and public property. The former may refer to assets operated by a specific state institution or branch of government, used exclusively by that branch, such as a research laboratory. The latter refers to assets and resources that are available to the entire public for use, such as a public park (see public space). In Neoclassical economic theory, the desirability of state ownership has been studied using contract theory. According to the property rights approach based on incomplete contracting (developed by Oliver Hart and his co-authors), ownership matters because it determines what happens in contingencies that were not considered in prevailing contracts. The work by Hart, Shleifer and Vishny (1997) is the leading application of the property rights approach to the question whether state ownership or private ownership is desirable. In their model, the government and a private firm can invest to improve the quality of a public good and to reduce its production costs. It turns out that private ownership results in strong incentives to reduce costs, but it may also lead to poor quality. Hence, depending on the available investment technologies, there are situations in which state ownership is better. The Hart-Shleifer-Vishny theory has been extended in many directions. For instance, some authors have also considered mixed forms of private ownership and state ownership. Moreover, the Hart-Shleifer-Vishny model assumes that the private party derives no utility from provision of the public good. Besley and Ghatak (2001) have shown that if the private party (a non-governmental organization) cares about the public good, then the party with the larger valuation of the public good should always be the owner, regardless of the parties' investment technologies. Yet, more recently some authors have shown that the investment technology also matters in the Besley-Ghatak framework if an investing party is indispensable or if there are bargaining frictions between the government and the private party. ^ "Public Ownership". Oxford Dictionaries. Retrieved January 25, 2018. Ownership by the government of an asset, corporation, or industry. ^ Tupper, Allan (February 7, 2006). "Public Ownership". The Canadian Encyclopedia. Historica Canada. Retrieved January 25, 2018. public ownership generally refers to enterprises, wholly or partially government owned, which sell goods and services at a price according to use. According to this definition, government-owned railways, airlines, and utilities are examples of public ownership, but hospitals, highways and public schools are not. ^ Hastings, Mason and Pyper, Adrian, Alistair and Hugh (December 21, 2000). The Oxford Companion to Christian Thought. Oxford University Press. p. 677. ISBN 978-0198600244. Socialists have always recognized that there are many possible forms of social ownership of which co-operative ownership is one. Nationalization in itself has nothing particularly to do with socialism and has existed under non-socialist and anti-socialist regimes. Kautsky in 1891 pointed out that a ‘co-operative commonwealth’ could not be the result of the ‘general nationalization of all industries’ unless there was a change in ‘the character of the state’. ^ Arnold, Scott (1994). The Philosophy and Economics of Market Socialism: A Critical Study. Oxford University Press. p. 44. ISBN 978-0195088274. For a variety of philosophical and practical reasons touched on in chapter 1, the most obvious candidate in modern societies for that role has been the state. In the past, this led socialists to favor nationalization as the primary way of socializing the means of production…The idea is that just as private ownership serves private interests, public or state ownership would serve the public interest. ^ Frederick Engels. "Socialism: Utopian and Scientific (Chpt. 3)". Marxists.org. Retrieved 2014-01-08. ^ Clarke, Alison; Paul Kohler (2005). Property law: commentary and materials. Cambridge University Press. p. 40. ISBN 9780521614894. ^ Hart, Oliver (1995). "Firms, Contracts, and Financial Structure". Oxford University Press. ^ Hart, Oliver; Shleifer, Andrei; Vishny, Robert W. (1997). "The Proper Scope of Government: Theory and an Application to Prisons". The Quarterly Journal of Economics. 112 (4): 1127–1161. doi:10.1162/003355300555448. ISSN 0033-5533. ^ Hoppe, Eva I.; Schmitz, Patrick W. (2010). "Public versus private ownership: Quantity contracts and the allocation of investment tasks". Journal of Public Economics. 94 (3–4): 258–268. doi:10.1016/j.jpubeco.2009.11.009. ^ Besley, Timothy; Ghatak, Maitreesh (2001). "Government versus Private Ownership of Public Goods". The Quarterly Journal of Economics. 116 (4): 1343–1372. doi:10.1162/003355301753265598. JSTOR 2696461. ^ Halonen-Akatwijuka, Maija (2012). "Nature of human capital, technology and ownership of public goods". Journal of Public Economics. Fiscal Federalism. 96 (11–12): 939–945. doi:10.1016/j.jpubeco.2012.07.005. ^ Schmitz, Patrick W. (2015). "Government versus private ownership of public goods: The role of bargaining frictions". Journal of Public Economics. 132: 23–31. doi:10.1016/j.jpubeco.2015.09.009.